Towards the end of this story, a dear friend of ours pointed out that when I tweeted about having plenty of "doctors" I actually meant "medics". Usually this kind of pedantry is not considered to be very polite, but I live in Cambridge; pedantry is our thing, and of course she was completely correct that amongst our friends, "Dr" usually means PhD, and even veterinarians outnumber medics. And, of course, any story where it is important to point out that the doctor is actually someone who works in a hospital, is not an entirely happy story. At least it did not involve eye surgeons! My brother-in-law's birthday is near the end of August, so last weekend we went to Sheffield to celebrate his 30th. Rachel wrote about our logistical cockups, but by the time of the party we had it back under control. My sister's house is between our AirB&B and the shops, so we walked round to the party, then I went on to Sainsburys to get some food and drinks. A trip to the supermarket SHOULD be boring. While I was looking for some wet wipes, one of the shop staff nearby was shelving booze. He was trying to carry too many bottles of prosecco in his hands at once. It hit the floor about a metre from me, and smashed - exploded - something hit me in the face! "Are you ok?" he said, though he probably swore first, and I was still working out what just happened. "What?" It didn't feel painful. I touched my face. Dripping off my nose. A few drops per second. He started guiding me to the first aid kit. "Leave your shopping there." We had to go past some other staff stacking shelves. "I just glassed a customer!" he said, probably with some other explanation I didn't hear so clearly. I was more surprised than anything else! In the back of the shop I was given some tissue to hold against the wound. 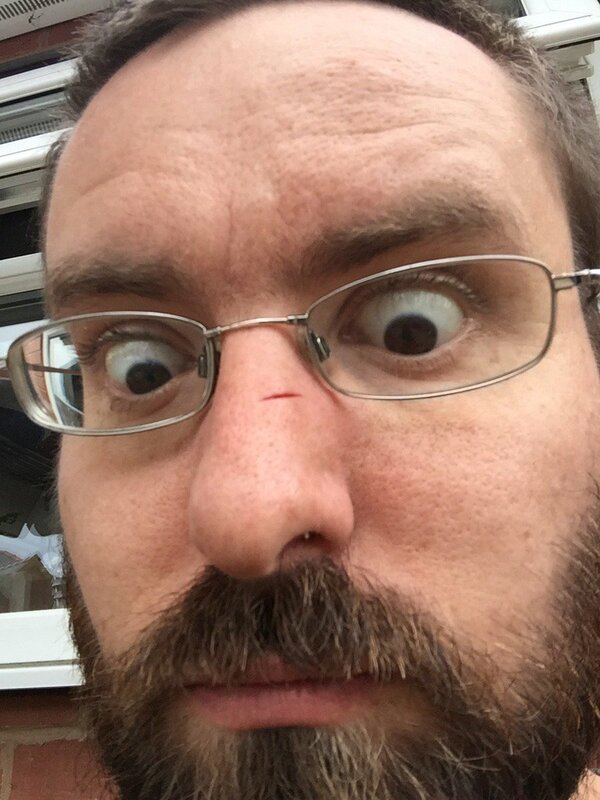 I could see in the mirror in the staff loo it was just a cut on the bridge of my nose. I rinsed off the blood and Signor Caduto Prosecco found some sterile wipes and a chair for me to sit on. Did I need to go to hospital, I wondered? I wasn't in pain, the bleeding was mostly under control. Will I need stitches? Good grief, what a faff. I phoned my sister, the junior doctor. "Er, no." (Usual bromides not helpful right now!) I summarized what had happened. "I'll come and get you." I can't remember the exact order of events, but before I was properly under control (maybe before I made the phone call?) the staff call bell rang several times in quick succession and they all ran for the front of house. It was a shoplifter alert! I gathered from the staff discussions that this guy had failed to steal a chicken and had escaped in a car. Another customer was scared by the would-be-thief following her around the shop, and took refuge in the back of the shop. In due course my sister arrived, and we went with Signor Rompere Bottiglie past large areas of freshly-cleaned floor to get my shopping. He gave us a £10 discount (I wasn't in the mood to fight for more) and I pointedly told him not to try carrying so many bottles in the future. 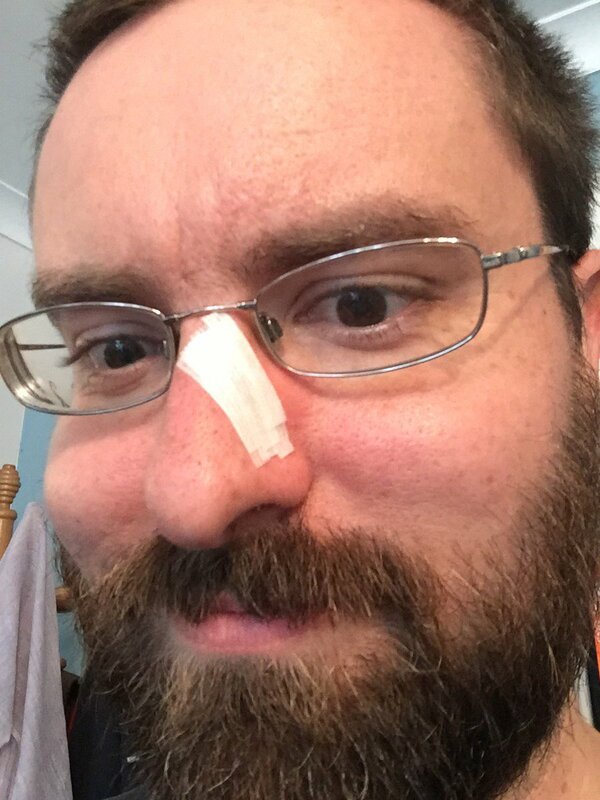 By this point my nose had stopped bleeding so I was able to inspect the damage and tweet about what happened. My sister asked around to find someone who had plenty of A&E experience and a first aid kit. One of her friends cleaned the wound and applied steri-strips to minimize the scarring. It's now healing nicely, though still rather sore if I touch it without care. I didn't even know you had the beard! I should come up to Cambridge more often. I hope it all heals up ok! I think you need to put that voucher towards home delivery, rather than risk leaving the house again. Ha :-) Monsieur le Frappeur de Crement just took the money straight off the bill. We do in fact usually get food delivered - better selection and a bit cheaper than the shops round the corner.